One of a pair of Roman fresco panels (see also 72.AG.84) portraying seaside scenes. The two panels were originally part of the same wall. Each contains a tondo painted in an impressionistic manner, predominantly in shades of blue and green. This panel depicts a mythical scene in which Hercules has just rescued the Trojan princess Hesione from a sea monster. One of Hercules'' men is battling the monster to the left, hurling rocks at it, while Hercules leads the freed Hesione away. According to the myth, Zeus ordered Apollo and Poseidon to build the city walls of Troy for King Laomedon. The king did not pay them, however, and Poseidon sent a sea monster to ravage the land. In order to end this curse, Laomedon had to sacrifice his daughter Hesione to the monster. Herakles, who was passing by, happened to see Hesione staked out for the monster and rescued her. In the scene on the fresco panel, the hero—seen from behind with his lion’s skin and club—accompanies Hesione back to a group of Trojans, while others drive away the beast. Depictions of Hercules and Hesione were rare in Greek art and were only somewhat more popular among the Romans, who used the scene in paintings and mosaics for interior decoration. 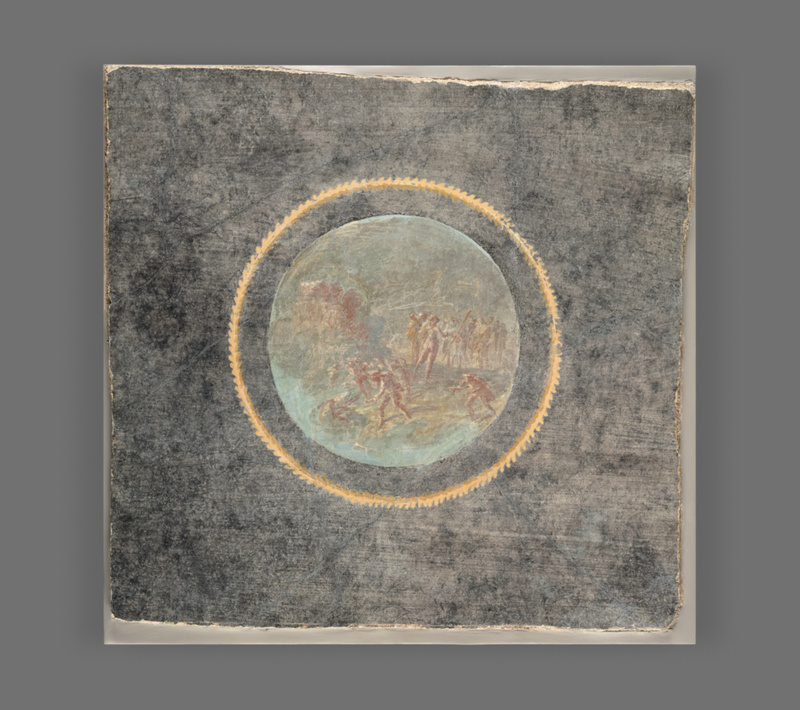 This fresco fragment was part of a larger scheme of painted decoration for a wall in a wealthy home. The painting style, categorized by scholars as Fourth Style, is the last style of Roman wall painting, and combines the spatial vistas of the Second Style with the fantastic architecture of the Third Style. It was popular from approximately 63 B.C. until A.D. 79, when Pompeii and Herculaneum were destroyed. The houses excavated at those sites show that a panel like this one would have been a minor element of the wall's decoration, subsidiary to a large panel with a mythological or architectural motif. Elie Borowski, Polish, 1913 - 2003 (Basel, Switzerland), sold to the J. Paul Getty Museum, 1972. Vermeule, Cornelius, and Norman Neuerberg. Catalogue of the Ancient Art in the J. Paul Getty Museum (Malibu: J. Paul Getty Museum, 1973), pp. 49-50, no. 105, ill.
Oakley, John H. "Hesione." In Lexicon Iconographicum Mythologiae Classicae VIII (1997), pp. 623-629, p. 625, no. 13; pl. 386.